Rumors of Apple building a cheaper iPhone (let's call it the iPhone "Mini" for now) have intensified in recent weeks. I have no doubt that Apple is at least considering such a move, even if it ultimately decides against it, because of rising smartphone saturation in key markets. This post does not attempt to predict the launch of such a product. Rather, it focuses on the pricing & launch strategy that Apple could follow if it does launch the iPhone Mini. NAND Flash Memory & RAM - Memory costs tend to vary linearly with capacity. I have assumed that the iPhone Mini would house 8 GB of storage and 512 MB of RAM (half of that found in the iPhone 5), in line with the iPhone 4/4S. Display & Touchscreen - Rumors have been mixed regarding the screen size of the iPhone Mini. But we can safely assume that Apple will not add to the cost by increasing the screen size of the iPhone Mini. Also, since the screen size of most competing low-mid range smartphones is in the 3.5-4 inch range, we can't expect Apple to go smaller. Since Apple has chosen a 4 inch screen size for the high-end iPhone 5 model (for now), I've assumed that the iPhone Mini would have a 3.5 inch screen. The product is also likely to have a retina display since it has been 3 product cycles from the last non-retina iPhone. 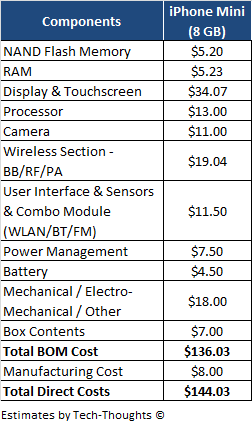 Finally, as before, I've estimated the cost based on the screen area and pixel density. Processor & Camera - I've assumed the same components & cost as the iPad Mini, i.e. A5 processor and 5 MP camera. Wireless Section - Since the product is meant to be focused at the low end of the market, particularly emerging markets, I've assumed that it lacks LTE. 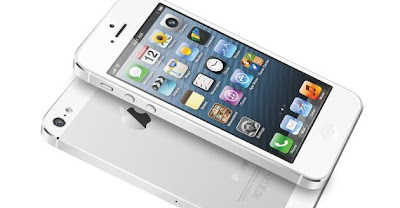 UBM Techinsights had estimated that the non-LTE baseband section found in the iPhone 4S was 56% of the cost of that found in the iPhone 5. I've estimated the cost of this component based on this ratio and iSuppli's iPhone 5 BOM. Mechanical, Electro-Mechanical & Other - The outer casing/shell makes up the majority of the cost of this component. Rumors state that Apple intends to bring down the cost of the iPhone Mini by using a polycarbonate plastic shell instead of the aluminum/glass used in other iPhone models. Since the Nokia's Lumia devices use the same polycarbonate plastic casing, I have assumed the cost of this component to be the same as that found in the Lumia 900. Others - I've assumed the user interface module, battery and box contents to be the same as that found in the iPhone 5, while the power management section is from the iPad Mini (cheaper than the iPhone 5). After the launch of the iPad Mini, we can safely say that Apple will not compromise on margins and will price its products at a premium even at the low end of the market. 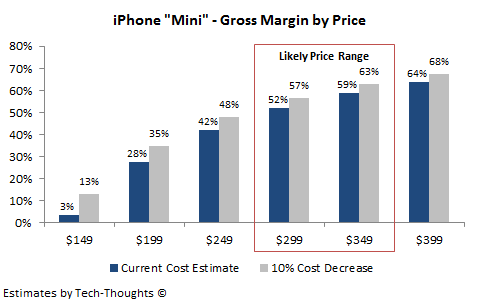 This means that Apple will expect to make gross margins comparable to those from the current iPhone. I've calculated the gross margins based on the cost estimate constructed above and taking into account a further 10% drop in costs over the next 6+ months. Apple currently makes a gross margin of 68% on the iPhone 5, which means that it would expect a gross margin hovering around 60% from the iPhone Mini. This would put the price of the iPhone Mini in the $299-$349 range, i.e. in the same ballpark as the iPad Mini. Emerging Markets - Apple's goal would be to make a bigger impact in emerging markets such as China & India, where subsidized smartphone sales aren't necessarily the norm and the high iPhone prices have capped market share gains. The unsubsidized price of the iPhone Mini is likely to be a little lower than that of the older iPhone models found in these markets. As a result, Apple would likely see a sales boost, especially if it is accompanied with greater carrier support. Given recent reports about soft iPhone 5 demand, emerging market growth could be critical for Apple's growth prospects. (i) Replace older models in Postpaid Market - With the current subsidized pricing scheme ($199, $99 and $0 for the last 3 iPhone models), there really is no space for a cheaper iPhone. So an iPhone Mini launch in mature markets would have to coincide with Apple deciding to pull one or both of the older iPhone models from the market. This would also mean that Apple wouldn't see any further cannibalization of iPhone sales in mature markets. (ii) Launch in Prepaid Market - Prepaid carriers in mature markets currently have a very small share of subscribers and the impact on iPhone sales would likely be minimal. But in the event of any disruption in the subsidized model in mature markets, Apple could quickly bring the iPhone Mini to mainstream carriers and even though the cannibalization & revenue impact would be massive, it would be far better than living with the resulting lost sales. Given these factors, launching an iPhone Mini seems to be a "no-brainer". The problem is that the addition of a new iPhone model is likely to complicate Apple's supply chain & manufacturing operations and affect margins. Within Apple, this could be the primary opposing factor to this iPhone Mini project.